Managing your time as a blogger can be tough. 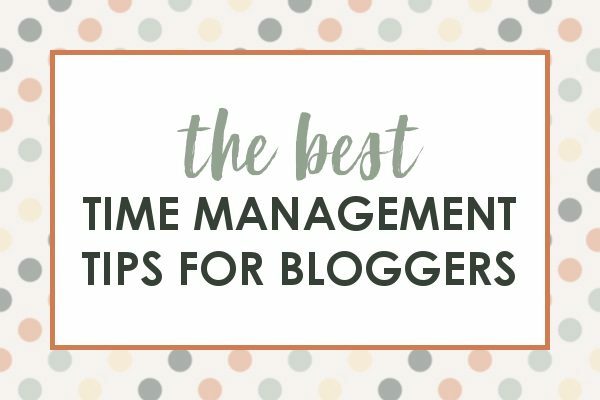 These time management tips for bloggers will help you sort out where to spend your time to make the most impact! If you’re like me, you can get easily distracted by all the “other” tasks that surround blogging and lose track of the ones that really matter. It’s a common dilemma that many bloggers face, especially when there is a family or full time job in the equation. But really, when you know what to prioritize, you can get all your blogging work done in just a few hours a week! Below is a condensed excerpt from my book “The Family Blogger: Running a Successful Blog without Sacrificing Family Time”. It will walk you through the time requirements for each “standard” blogging task, give some time management tips for each point, as well as help you determine which areas are most important for your blog. Read more about The Family Blogger here! Below is an index of this entire post. Reading the whole post will help you the most, but if you want to jump around, use these links! Each section has tips for time management for the topic. I’ve listed out how long each blogging task “should” take you so that if you know you only have 2 hours per week to work on the blog, you’ll be able to choose the things that make the most impact on your page views and income. If you are trying to hit most of the things on this list, you are looking at about 5-20 hours per week of blogging and blogging related tasks, depending on how many posts you write per week and how much you are promoting your content. However, remember that not everything on the list is 100% necessary and that prioritizing is a good thing! Prioritize the areas that bring in page views and money first, then worry about the rest from there, depending on how much time you have available. For example, if 80% of your page views come from Pinterest, then you can’t cut that! You need to keep working Pinterest, but Facebook, Instagram, and Twitter can go. Also, if Pinterest is 80% of your traffic, then be sure to check out how to work SEO into your posts to increase organic traffic in just 5-10 minutes per post. Take a look at your income and page views – determine WHICH tasks are really contributing to those numbers and then prioritize those tasks. Don’t get hung up on which topics are best as every site has something different to offer. Instead, focus on enriching your reader’s life with your content! Write your entire post first, then create the images, THEN check this list to make sure you’ve done everything you need to before publishing. Here are the things you need to make sure EVERY SINGLE post has before you hit publish! At least 350 words (over 1,000 words is better and will help you rank higher in Google searches, but 350 is a good minimum). At least 2 images. Make sure all images are at least 600px wide. Affiliate links for products mentioned. Back links to related posts within your site. A related post recommendation at the bottom (I like to use the Content Views plugin for this in WordPress). Proof-read for spelling and grammar (including text on photos). This process does vary from blogger to blogger. Some like to write a short and sweet 350 words, others average 1,500 words per post. However, in general, regardless of your writing style, 1 hour per post is a reasonable estimate for just writing the content. Add another 20 minutes to this for adding applicable affiliate links to the post, and another 10 minutes to link all appropriate relevant posts from your own blog. Jot down content on your phone and email it to yourself as you go through the day. I’ve often written up the bullet-points for a new post while standing in line and the grocery store. Then once I’m home, I can flesh out the post more fully, but I don’t have to remember my thoughts from earlier! A “Pinterest style” image: see examples here. The size I recommend is 700 x 1500px. In addition to those images you may find that DIY projects need more pictures. A great way to reduce the time spent on this part of blogging is to create a template for your Pinterest image (2 images with text in the middle), then crop the Pinterest template for your Facebook and Featured images. This usually takes me about 20 minutes per post, but a more realistic number until you have your templates down is about 1 hour per post. This is going to depend on your readership. It took me 2 years before I started getting consistent comments on my blog every day. What I would recommend is looking at your last month, finding how many comments you had, and allowing about 2 minutes per comment. Depending on your subject matter, responding to emails may be a lengthy process. For me, each email I respond to can take up to 30 minutes! But the average seems to be about 7 minutes per email. I just wanted to let you know that I got your email! Due to the high number of emails I get everyday, and the time I like to take with each person, response time is changing a bit. Every email will be read and responded to, but it may be a few days, so hang in there! If you are emailing me about an infographic or a guest post, thank you but I am not interested at this time and please remove me from your list. Otherwise you will hear from me soon! Here are a few posts that answer frequently asked questions, if you’d like to check them out! Sign up for my blogging newsletter for the best tips every Wednesday! Thank you again and we will talk soon! That simple email frees me from the feeling that I need to respond to emails right away, when I may not have 2-4 hours to get back to everyone in the way I normally would! Rather, I can sit down 2-3 times a week and respond in bulk at a pre-determined time. Promoting your blog content is a MAJOR part of blogging, so these tasks are just as important as writing high quality content. Make sure that you are spending time getting your content in front of the right people each week so that your page views and income will continue to grow. I would recommend focusing on them in the order that follows… unless you are getting high traffic in a different order. If you are pinning manually each day (actually logging in to Pinterest and pinning live) set aside 10 minutes a day for this task. If you are scheduling your pins in advance with a Pinterest scheduler like Tailwind, set aside 30-45 minutes per week. If you want to pin manually, pin 5-6 pins (a mix of your own and others) first thing in the morning. Another 5-6 in the afternoon, and 10-12 around 8pm. Keep a close eye on the time and don’t get “sucked into” Pinterest for too long! Check out this awesome course if you want to know more about advanced Pinterest techniques! I just finished it and it basically blew my mind on the inner workings of Pinterest! Facebook is an interesting beast. It can be an amazing traffic driving tool if used correctly. I joined this free Facebook group for growing your Facebook page and it’s helped me a lot! Join the group and watch all the videos for free! I cut Facebook if I need to save time during the week. Engaging with fans is wonderful, but if you are low on time, focusing on page views and income needs to be top priority! Create a spreadsheet with a column for each day with time slots along the side. Then create a master list of links to pull from and just copy/paste them into the available time slots. Once you have your schedule filled out you can copy/paste onto your Facebook page mass-schedule them more easily! Instagram can end up taking a lot more out of your day than you might realize. Between finding the perfect shot, the perfect filter, and the perfect hashtags, it can take up to 30 minutes just to share a single photo every day! Combat this by taking photos in batches (don’t try to find one every day to share fresh), edit them, and plan out your hashtags in a note on your phone. Then all you have to do is once a day go into Instagram to copy and paste in the hashtags, add a description and post! This also allows you to save time by doing it all at once. NOTE: Instagram is the first thing that gets cut for me when I’m low on time. I don’t see a lot of traffic from it, so while it’s a fun platform, I don’t prioritize it above posts and Pinterest. If you want to grow your Twitter audience, spending about 15-30 minutes a day there, interacting with your followers and others in your niche, is a good place to start. You can set up Facebook posts to automatically post to Twitter as well. While it’s not the best option for growing your Twitter audience, it is a great way to have a presence there without having to devote extra time to the platform! Once you have your active blogging and social media tasks, if you have time left over, here are the extra blogging tasks to work on. This is a task that helps build a loyal readership who visits your site often and really cares about what you have to say. So writing a weekly newsletter is a great thing to do, in general. But don’t let it be the straw that broke the camel’s back. If you have time, write one. If you don’t have time, skip it. If you don’t have a newsletter set up yet, MailChimp is what I use and it’s free up to 2,000 subscribers! To gain more subscribers, create an appealing “freebie” that people have to subscribe to get. Here’s the freebie I created that gained me over 10,000 subscribers in my first year of blogging! At first, writing a newsletter will likely take you 2 hours per week. However, once you have a template set up you can write a newsletter in less than 30 minutes per week. Create a round up post of related posts for your newsletter. This is like a custom curated letter to friends that has a bunch of seasonal or timely content you know they will like! But it only takes a few minutes to pull together related content and right a few sentences about each post. Once you’ve had your newsletter for a while, you can pull posts from the same week of the previous year and update with additional content! This is one of the most important things you can do for your blog. People WANT to support your blog by making a purchase. I know it sounds odd, but they do! Make sure you have something for them to buy. Prioritize this step as much as you can. NOTE: Creating a product can be all consuming, so make realistic goals for when you are going to finish and how much time you can really devote to it each week. Having created 3 products now, I can say that in my experience, writing, creating graphics for, editing, and polishing a product shakes out to be about 10 minutes per page. So if you’re writing a 10 page mini-book your time investment is going to be a lot less than if you’re writing an authoritative guide within your subject that is likely to be 100s of pages! Break down each task into 15-20 minute tasks. Write them in a Word Doc, or in your blogging notebook for easy reference. Then if you find yourself with a little extra work time you can knock a few out without having to remember what’s next! If you are growing your Facebook page, you will find that creating videos helps you grow in the fastest way! But they can be time consuming. Brainstorming, recording, editing, and polishing videos can take about 2 hours per 1 minute of finished video. Most videos will be between 50 seconds and 2 minutes. I use Movavi to create square videos (which Facebook loves) and it’s the best option for an inexpensive yet powerful video editor! It also has a Mac and PC option. If you are able to, carve out 2 hours for just recording. Shoot 2-4 videos and then schedule editing for a different time. Now that you know how much time you need for each task, and which tasks are the most important for you, grab The Family Blogger Worksheet 6 below (if you haven’t already) and make sure each task has a time slot where you and your family both agree the time is available. Tape it to the fridge for reference and get to work! Note: If you are already a member of the newsletter, you can go to the members only download page here to get this worksheet! Grab the password from the latest newsletter! Grab the member only download by joining for free below! Subscribe to my blogging newsletter! Previous Post: « How Do I Upload My Header or Logo?